Social Media Marketing is all about using social sites such as Facebook, Twitter, Linkedin, Squidoo, Hub Pages, and Blogs for the purposes of sales, PR and marketing of your local business. Social media is all the buzz right now but very confusing to a local business owner who hears conflicting information about the level of commitment required and value it provides to a business. Social media sites are communities and you have to be transparent and participate consistently to the communities you belong to and create. The prospect is a customer of the social media site and not of your business – but it doesn’t have to be that way. Interaction and relationship building should be the goal of your presence on these sites rather than hard-core marketing. Actively participate in other people’s discussions and offer valuable content and advice. Don’t be selfish or self-serving – your dialogue shouldn’t just be about you and your business. You have to earn the right for some self-promotion. If all this sounds like work – then it is. But like Martha Stewart’s presence on social media sites you can have somebody else represent you on your Facebook business page or Twitter, and outsource content building on Squidoo, Hub Pages and blogs. 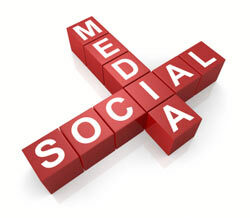 Having a clear goal and a plan on how to use social media to achieve that goal are activities we help clients identify. New England Local Marketing can then provide social media marketing services to execute on the same plan. Social media may not be for every local business but with the recent explosion of these kinds of sites and their phenomenal following, they cannot be ignored as an opportunity to capture more customers and increase profits. New England Local Marketing can help you figure out how to leverage the power of social media for your local business. IMPORTANT: Unlike other Internet Marketing agencies all the content we create for you… you own – whether you hire us for other services or not. The same goes for any web site work and accounts at various social media sites we create for you. You own the copyright for this content not us! If you ever decide one day you don’t need us anymore then everything we’ve created for you stays in place. Make sure whoever you hire to create content for you – you have clear and “no strings attached” ownership of the work!